Celiac disease (also known as celiac sprue and gluten senstive enteropathy) is a chronic inflammatory disorder characterized by mucosal damage to the small intestine leading to gastrointestinal illness, nutrient malabsorption, and a wide range of clinical manifestations (NIH, 2004; han, et al. 2002). There is a consensus opinion that celiac disease is caused by an aberrant (T lymphocyte) immune response to dietary glutens predominantly found in wheat, barley, and rye (NIH, 2004). However, there is evidence that at least some persons who have celiac disease may not tolerate oats (Lundin et al., 2003; Arentz-Hansen et al., 2004). Those individuals who have a genetic predisposition to celiac disease react to peptides within the proline- and glutamine-rich protein fractions of the grains (Dewar et al., 2004). For affected individuals, celiac disease is a lifelong condition and, if not treated, is associated with significant morbidity and increased mortality (Fasano, 2003; Corrao et al., 2001; Dewar et al., 2004). There is no cure for celiac disease (NIH, 2004). Strict avoidance of potentially harmful concentrations of glutens in the diet is the only known means of completely preventing the clinical and pathological complications of celiac disease (NIH, 2004; Fasano and Catassi, 2001). 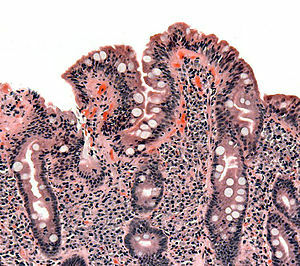 Celiac disease is characterized by injury to the mucosa of the small intestine and specifically targets the fingerlike projections, called villi, where absorption of key nutrients takes place (Figure III-1). This injury is believed to be due to an autoimmune disorder involving modification of the antigenic presentation of gluten in the intestinal tract of genetically predisposed individuals expressing the major histocompatibility haplotypes HLA-DQ2 or HLA-DQ8 (Farrell and Kelly, 2002; Fasano, 2003). In these individuals, binding of the enzyme tissue transglutaminase (tTG) to wheat gluten (a glutamine rich protein) potentiates uptake and presentation by antigen-presenting cells in the lamina propria, triggering a vigorous T-cell response (Schuppan and Hahn, 2002), leading to production of IgG and IgA antibodies directed to wheat gluten peptides (i.e., gliadins and glutenins) and to tissue transglutaminase (tTG). The activated T-cells are responsible for the mucosal damage seen in celiac disease (Fasano and Catrassi, 2001). This immune-mediated damage occurs in two compartments, the epithelium and the lamina propria (Green and Jabri, 2003). Early intestinal disease is characterized by an increased number of intestinal intraepithelial lymphocytes (IELs). As the disease progresses, increasing numbers of lymphocytes and plasma cells infiltrate the lamina propria. This increase in the numbers of cells leads to elongation of intestinal crypts and shortening of villi, which eventually results in partial or total villous atrophy (James, 2005). Elimination of intestinal gluten results in modification of T lymphocyte and antibody responses and, in most cases, full mucosal recovery (Kaukinen et al., 1999; Fasano and Catassi, 2001). 2005a). These are rare intestinal malignancies with a high mortality rate. In addition, the relative risk for developing non-Hodgkin’s lymphomas, intestinal or extraintestinal, is three fold greater than in the general population (Catassi et al., 2002). These cancers contribute to nearly two thirds of deaths due to celiac disease and are a major reason for the nearly two-fold increase in overall mortality of adult patients with celiac disease compared to the general population (Corrao et al., 2001). Currently, individuals with clinical manifestations, or “symptomatic” celiac disease, are believed to represent a small portion of the total affected population (Mäki and Collin, 1997). A larger number of individuals are believed to have “silent” celiac disease, characterized by positive serology and intestinal mucosal abnormalities in the absence of symptoms or nutritional deficiencies. Mäki and Collin (1997) also suggested that there is an even larger population with “latent” celiac disease, individuals who are positive for serological markers or genetic susceptibility to disease and are entirely asymptomatic. It is generally accepted that individuals with silent or latent disease, although asymptomatic, have the capability to manifest aberrant immune responses following exposure to dietary glutens and are, therefore, at increased risk for both acute and long-term complications of celiac disease (Fasano, 2003; Schuppan, 2000). However, the long-term benefit of strict gluten avoidance for these individuals is unproven (Green and Jabri, 2003). Until recently, celiac disease was considered to be a rare disorder in the U.S., with an estimated prevalence rate of 1:5,000 (Talley, 1994). However, a large epidemiological study screened more than 13,000 people in 23 states and estimated a prevalence rate of 1:133 within the general U.S. population (Fasano et al., 2003). The National Institutes of Health Consensus Development Conference Statement on Celiac Disease currently estimates that 3 million Americans, a little less than 1 percent of the population, may have celiac disease (NIH, 2004). Celiac disease occurs widely among North American and European populations, where wheat is a staple food, but is infrequent among native descendents of China and Japan and those with an African-Caribbean background, where wheat is not as widely consumed (Farrell and Kelly, 2002). Precise prevalence data for celiac disease are not available. This disease is often misdiagnosed as another gastrointestinal malabsorptive disorder (e.g., irritable bowel syndrome) due to similarities in their symptoms (Sanders et al., 2001). Due to the existence of silent or latent cases, it is assumed that the incidence of celiac disease is underreported (Mäki and Collin, 1997). These forms of celiac disease may go undetected in individuals for years before they develop symptoms causing them to seek medical attention (Green and Jabri, 2003). Mäki and Collin (1997) postulated that there are many more currently healthy individuals who are genetically predisposed to developing celiac disease in future years than there are individuals who are now affected by celiac disease. Only recently has the medical community become more aware of the need to screen for celiac disease when patients experience health problems that may be associated with the disease or when patients have family members, especially first- and second-degree relatives, who have celiac disease (NIH, 2004). 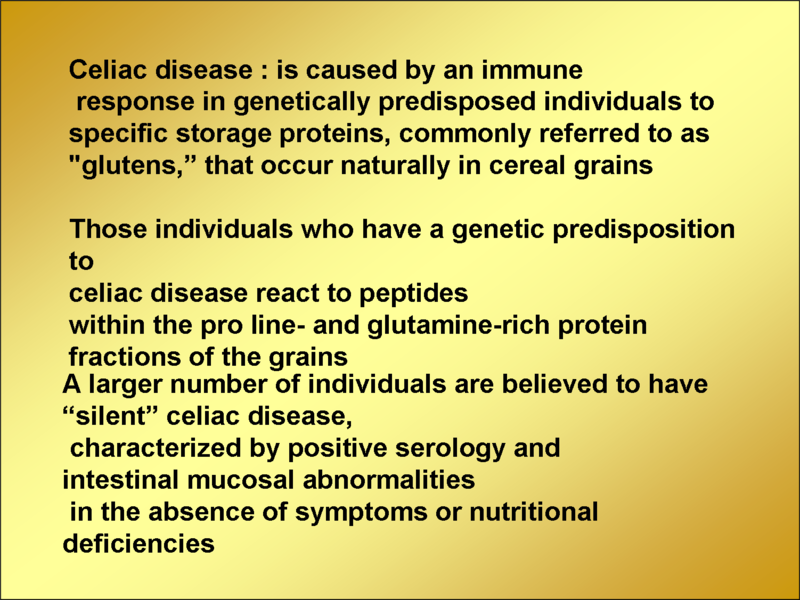 Celiac disease is caused by an immune response in genetically predisposed individuals to specific storage proteins, commonly referred to as “glutens,” that occur naturally in cereal grains (Shan et al., 2002). Technically, “gluten” is a term applied specifically to the combination of the prolamin proteins called “gliadins” and the glutelin proteins called “glutenins” found in wheat (Brown, 2004). However, the term “gluten” has been used generically to refer to prolamin and glutelin protein mixtures found in other cereal grains (Kasarda, 2005, personal communication). Although all cereal grains contain prolamin and glutelin proteins, these proteins are not identical in different grains. These proteins differ in their amino acid sequences in different grains, and not all have been shown to evoke an abnormal immune response that affects the intestinal lining of persons genetically susceptible to celiac disease (Kasarda, 2003). The term “gluten” will be used in this report in the more general sense of the combination of both prolamin and glutelin proteins found in cereal grains. The grains considered to be capable of producing adverse effects in individuals with celiac disease include the different species of wheat (e.g., durum, spelt, kamut), barley, rye, and their cross-bred hybrids (e.g., triticale, which is a genetic cross between wheat and rye) (Kasarda, 1994; Kasarda, 2004). There is also evidence that some individuals with celiac disease may react adversely to oats (Lundin et al., 2003; Arentz-Hansen, 2004). These grains are all members of the grass family (Gramineae, also known as Poaceae) and are closely related taxonomically. The cereal grains assumed to be safe for persons with celiac disease include amaranth, buckwheat, corn, Indian ricegrass, Job’s tears, millet, quinoa, ragi, rice, sorghum, teff (or tef), and wild rice (Kasarda, 2001; Johnson et al., 2002; Kasarda, 2004b; Kupper, 2004). The grain prolamins of concern include gliadin in wheat, secalin in rye, hordein in barley (Thompson, 2001; Green and Jabri, 2003; Kagnoff, 2005) and possibly avenin in oats (Arentz-Hansen, et al. 2004; Lundin, et al., 2003). There is substantial evidence that both prolamin proteins (i.e., gliadins) and glutelin proteins (i.e., glutenins) in wheat affect individuals with celiac disease (Shan et al., 2002; Hausch et al., 2002; Vader et al., 2002; van de Wal et al., 1999; Molberg et al., 2003). Wheat gliadin subtypes alpha, beta, gamma, and omega, have been shown to affect individuals with celiac disease (Ciclitira et al., 1984; EFSA, 2004). Rye, barley and triticale are taxonomically related to wheat, express peptides structurally similar to those found in wheat, and have been reported to affect individuals with celiac disease (Vader et al., 2002; Kasarda, 2001; Kasarda, 2004b). In contrast, the prolamins in other cereal grains (e.g., zein in corn and orzenin in rice) have been shown not to affect individuals with celiac disease (EFSA, 2004; Kasarda, 2004b). However, much is still unknown about which proteins in the different grains can affect individuals with celiac disease (Kasarda, 2001). food may be used as an indicator that gluten proteins are present. The USDA National Nutrient Database for Standard Reference, Release 17 (USDA, 2004), the major source of composition data for foods in the U.S., includes hundreds of food items that contain wheat, rye, barley, triticale or oats as an ingredient. Wheat, in particular, is used to manufacture a wide range of food ingredients and finished foods. Rye, barley, triticale, and oats are used to make substantially fewer food products. Koehler and FDA (2005) estimated the average amount of total grain and individual types of grain available for consumption per person in the U.S., and the total exposure to gluten-forming proteins that would result from this grain consumption. The estimated mean daily consumption rate was approximately 250 grams of grain per capita. Wheat provided 180 of the 187 grams per person per day of grains that are of concern for individuals with celiac disease. There is no consensus as to whether oats present a hazard for all individuals with celiac disease. Several studies, including one that lasted 5 years, have reported that most celiac study participants tolerated moderate amounts (e.g., 50-70 grams daily) of oats (Janatuinen et al., 1995; Janatuinen et al., 2000; Janatuinen et al., 2002; Lundin et al., 2003; Arentz-Hansen et al., 2004). The oats used by Lundin et al. (2003) and Arentz-Hansen et al. (2004) were tested to ensure that they did not contain any gluten proteins from wheat, rye, or barley. In the U.S., most commercially available oat products are believed to contain some gluten proteins from wheat, rye, or barley due to cross-contact with these grains during growth, harvest, transport, storage, or processing (Kasarda, 1999; Kasarda, 2001; AGA, 2001; Thompson, 2003). In a recent study, Thompson (2004) analyzed four lots of three brands of rolled or steel-cut oats commercially available in the U.S. for prolamins from wheat, barley, or rye. For one brand, all samples contained 338 to 1807 ppm gluten (expressed as the mean of duplicate determinations). For each of the other two brands, the level of gluten detected in all but one lot ranged from 12-725 ppm in one brand and 120-131 ppm in the other brand (expressed as the mean of duplicate determinations). Thus, only one lot of these two brands was negative for gluten. Thompson (2004) concluded that none of these three brands could be considered a reliable source of oats free of potentially harmful gluten proteins. Grains that do not contain gluten can become contaminated with grains that contain gluten at any step in the farm-to-table continuum, particularly if shared equipment is not thoroughly cleaned between uses. It is difficult, if not impossible, to prevent all cross-contact situations, considering the tons of grain handled by farm equipment, bulk storage, and transport containers on a daily basis. In fact, the Official United States Standards for Grains (USDA, 1999) assume that most grains that have an established U.S. standard will contain a small percentage of other grains. There is little information in the literature on minimal disease-eliciting doses of gluten for sensitive individuals. Gluten challenges have generally been performed in individuals where diagnosis is uncertain (e.g., infants, Laurin et al., 2002) or in individuals with unclear intestinal pathology results (Wahab et al., 2001). Challenges have also been performed to determine the time of disease relapse after a prolonged period of gluten avoidance (Mayer et al., 1989). In most cases, gluten challenges have been performed to elicit or confirm disease rather than to measure the level of sensitivity (Farrell and Kelly, 2002). There is no standard protocol for gluten challenges, and challenge studies have varied greatly in amount and duration of gluten exposure. Although some studies have been designed to determine the acute effects (i.e., after 4 hours) of exposure to gluten (Sturgess et al., 1994; Ciclitira et al., 1984), most challenges consist of an open challenge to a fixed or incremental dose of daily gluten over a minimum period of 4 weeks. Many challenge studies use a high exposure (> 10 g/day) to gluten, because this is believed to shorten time to disease confirmation or relapse and, therefore, to minimize discomfort to subjects (Rolles and McNeish, 1976). However, some studies have shown that low daily exposures to gluten also can elicit a disease response (Catassi et al., 1993; Laurin et al., 2002; Hamilton and McNeill, 1972). Catassi et al. (1993) reported that children, whose celiac disease had previously been controlled on gluten-free diet, had evidence of intestinal mucosal or immunological changes (changes in intraepithelial lymphocyte counts and the villous height to crypt depth ratio) following 100 mg or 500 mg of daily gliadin over 4 weeks; this corresponds to 200 mg and 1000 mg of daily gluten respectively (Collin et al., 2004). The degree of inflammation was dose dependent. However, this study had several important limitations, which include the short-term follow up (4 weeks), testing in young children, the small number of subjects (n=20), and the lack of control groups. In addition, although gliadin is believed to be the major immunogenic portion of gluten, T cells from the small intestine of celicac disease patients have been shown to be responsive to peptides from the glutenin portion as well (Van de Wal et al., 1999). Thus, the Castissi et al. (1993) study was also limited by the use of gliadin rather than gluten. Estimating potential harm by extrapolating from gliadin levels may not be representative of the harm from total gluten exposure. conservative threshold for gluten exposure for sensitive individuals would lie between 20 and 100 ppm. Source: Thompson T. Celiac Disease Nutrition Guide, 2nd ed. Chicago: American Dietetic Association; 2006. © American Dietetic Association. Adapted with permission. 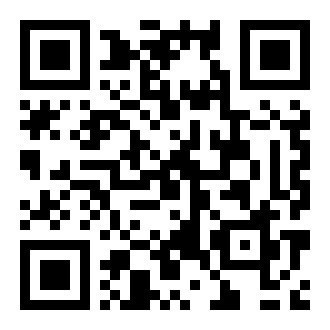 For a complete copy of the Celiac Disease Nutrition Guide, please visit www.eatright.org. in reaction to gluten, which is the protein found in wheat, barley, rye, and sometimes oats. as vitamins, minerals, proteins, fats and carbohydrates. What happens if a Celiac digests gluten – what is the reaction like? How do you know if food contains gluten? What do you do if gluten is digested by mistake? chocolate. Snickers ice cream bars. refrigerate. Can be stored in small freezer bags. handbook. Otherwise, you may delete this page. How can I tell if my children will be allergic to a dog’s hair. We want to get a puppy for them but just want to make sure we don’t give’em allergies.